1. The parent(s) and/or legal guardian(s) will instruct the minor participant that prior to participating in the below Vibe Dance Center activity or event, he or she should inspect the facilities and equipment to be used, and if he or she believes anything is unsafe, the participant should immediately advise the officials of such condition and refuse to participate. I understand and agreed that, if at any time, I feel anything to be UNSAFE, I will immediately take all precautions to avoid the unsafe area and REFUSE TO PARTICIPATE further. (a) There are risks and dangers associated with participation in Vibe Dance Center events and activities which could result in bodily injury partial and/or total disability, paralysis and death. 4. I/WE HEREBY RELEASE, WAIVE, DISCHARGE AND COVENANT NOT TO SUE the Vibe Dance Center facility used by the participant , including its owners, managers, promoters, lessees of premises used to conduct the Vibe Dance Center event or program, premises and event inspectors, underwriters, consultants and others who give recommendations, directions, or instructions to engage in risk evaluation or loss control activities regarding the Vibe Dance Center facility or events held at such facility and each of them, their directors, officers, agents, employees, all for the purposes herein referred to as “Releasee”...FROM ALL LIABILITY TO THE UNDERSIGNED, my/our personal representatives, assigns, executors, heirs and next to kin FOR ANY AND ALL CLAIMS, DEMANDS, LOSSES OR DAMAGES AND ANY CLAIMS OR DEMANDS THEREFORE ON ACCOUNT OF ANY INJURY, INCLUDING BUT NOT LIMITED TO THE DEATH OF THE PARTICIPANT OR DAMAGE TO PROPERTY, ARISING OUT OF OR RELATING TO THE EVENT(S) CAUSED OR ALLEGED TO BE CAUSED IN WHOLE OR IN PART BY THE NEGLIGENCE OF THE RELEASEE OR OTHERWISE. A yearly registration fee of $25 for individuals and $40 for families is due at the beginning of each dance year or at the time of registration. A mandatory recital fee of $30 per dancer is due by October 15th. We strongly encourage all students to participate in our annual recital. Our class structure is geared towards a final dance routine and the weeks leading up to recital include costume try on days, portrait days, and routine centered classes. If you do not want your child to participate in the recital, you will need to get approval from the directors of Vibe Dance Center (Jessica Anderson & Elizabeth Bedore). The first tuition payment is due at the time of registration and on the first of every month after that. A $10 late fee will be charged to your account after the 10th of the month if tuition has not been received. Our tuition pricing takes into account all holidays and days off; therefore full tuition is due every month with the exception of the month you register (if applicable) and June (prorated for recital once date is set). Full tuition is due if your child is absent due to illness or vacation. Any lapse in tuition payment will require you to re-register your student for classes and potentially lose their place. Serious illness or injury will be evaluated on a case by case basis. You are required to notify Vibe Dance Center by email or in writing if you choose to discontinue class. You have the option to sign up for auto-pay via your Parent Portal Account. If you decide to discontinue class you must notify us two weeks in advance to cancel your next auto pay transaction. If you would like us to include your balance for shoes, fees, merchandise, and/or costumes you can email, call, or let us know at the front desk and we will include the fees you approve. Vibe Dance Center will hold an annual dance recital in the month of June. It will be held by the 15th of June, depending on the availability of the facility. All students are required to attend the mandatory rehearsals leading up to recital. We will send out a save the date as soon as we confirm it. Each family is required to fill out/sign a Costume Payment Plan & Recital Fee Agreement at the time of registration. All sales are final and costume payments are nonrefundable. All costume fees must be paid in FULL by March 31. Your child will not be able to participate in the recital unless accounts are paid in full – costumes, tuition, fees, merchandise, etc. – before dress rehearsal. Vibe Dance Center’s main means of communication is via email and Facebook. All class cancellations, events, and general information will be sent via email. We highly recommend you follow us on Facebook and check your emails regularly to stay updated on studio info. We will also post all studio documents in the Parent Portal for your convenience. Solo, Duo, & Trio private lessons are available for students of all ages in all styles of dance, as well as, voice. You can review those policies on a separate form. If you are interested in performing a solo, duo, or trio please speak to the studio directors. The studio directors make the final decisions regarding all solos, duos, and trios. We offer a discount to unlimited tuition students. No sibling discount is applied to private lessons or solo/duo/trio packages. Payments can be made by check, credit card, or cash at the front desk or by credit card or PayPal online via the Parent Portal. We offer auto-pay that you can set up through the Parent Portal for your convenience. There is a return check fee of $20. There are no refunds on registration, recital fees, costume or tuition fees. Unworn merchandise may be exchanged for a different size in some circumstances. Defective costumes and merchandise may be exchanged if unworn, so inspect items you receive carefully. Costume payments are nonrefundable. Vibe Dance Center reserves the right to alter the schedule, cancel, or adjust the times of classes, events, or rehearsals. We will make every effort to inform students and parents of any changes as soon as possible. If your child misses a class you can inquire at the desk about scheduling a make-up class. If we have to cancel a class that is not a school holiday, or cancellation is due to inclement weather, then we will schedule a make-up class or provide an alternate class for your child. Students taking private lessons – vocal coaching or dance – are responsible for being on time to every lesson. Make every effort to notify the teacher of a cancellation at least 24 hours before the scheduled time. If the cancellation is 24 hours before the lesson, we will try our best to reschedule it for another time. If the cancellation is less than 24 hours before the lesson, it is at the teacher’s discretion whether a make-up lesson can be scheduled. A make-up lesson will be provided if the teacher has to cancel at any time. VDC follows the Pinellas County Public School schedule with regards to holidays. We will be closed on Halloween, the week of Thanksgiving, two weeks over Winter Break, and one week for Spring Break. Specific dates can be found on the Parent Portal and our website. The following dress code will be enforced! If your child is not in the proper dance attire or does not have their hair pulled back in the proper style for their class, the teacher will give them a Dress Code Warning Card as a reminder. If your child has multiple Dress Code violations, they may be asked to sit out or call home for proper attire. All students must purchase shoes through Vibe Dance Center. We may allow students with other dance shoes to use them for class, but our shoes must be ordered in time for group portraits & recital. Pointe shoes are the only shoes we do not order. If your child is going on pointe for the first time we will go with them to their fitting to ensure proper shoes are purchased. Please see us to order proper shoes! We can size your child at the studio. Girls: Any color or pattern leotard, biketard, unitard or sports top w/ boy shorts or leggings. Tights are optional. Boys: Tank top or t-shirt and athletic pants or shorts. Ballet & Pointe – Girls: Leotard and pink or tan tights and optional dance shorts or skirts. Hair should be pulled back into a neat bun. We recommend that all girls have a solid black leotard and some weeks we may ask that they wear them. Boys: Fitted tank top (A Line or undershirts) and athletic shorts that are above the knee. Acrobatics – Girls: Any color or pattern dancewear: bra tops, dance tanks, leotards, dance shorts, or dance leggings. Tights (any color) are optional. NO t-shirts – must be fitted dance/athletic wear! Hair should be pulled back into a neat bun. Boys: Fitted tank tops (A Line or undershirts) or fitted t-shirts and athletic shorts. No baggy clothes. Tap, Jazz, Lyrical, Contemporary, Musical Theater – Girls: Any color or pattern dancewear: bra tops, dance tanks, leotards, dance shorts, or dance leggings. Tights (any color) are optional. All clothing worn should be dance/athletic wear. Hair should be pulled back into neat ponytail or bun. Boys: Fitted tank tops (A Line or undershirts) or fitted t-shirts and athletic shorts. No baggy clothes. Hip Hop: Any of the above dancewear listed and/or t-shirts and sweatpants. Any tennis shoes or boots that are not worn on the street can be worn. NO STREET SHOES can be worn inside the studio. Vocal Ensemble: Any comfortable clothing. Jazz shoes or character shoes may be required for recital. 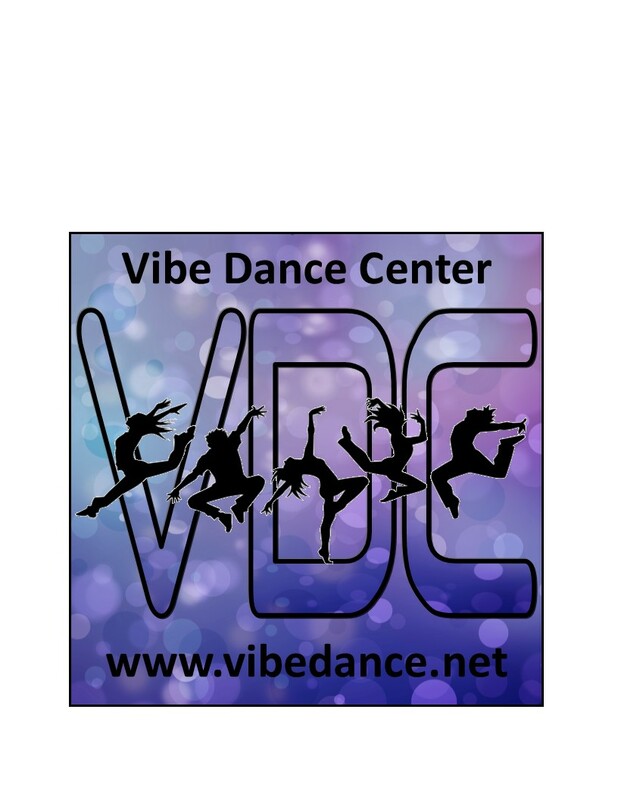 Vibe Dance Center may take photographs or recordings (still photographs, voice, or videos) of students, parents, and other relatives during classes, rehearsals, performances, or other events. We reserve the right to use these photographs and recordings for learning purposes and/or for marketing or media publications. This includes, but is not limited to: flyers, brochures, websites, and social media sites. •	Vibe Dance Center is dedicated to providing quality dance instruction in a safe and nurturing environment. Any inappropriate or slanderous remarks about Vibe Dance Center, its staff members, or students on any social media site will be cause for immediate dismissal from the studio. •	Attitudes that are disrespectful, uncooperative, or aggressive do not have a place at Vibe Dance Center. •	Students will not speak negatively about one another or the instructors. •	Any parent/guardian or student who disrupts class or approaches a teacher, staff member, another student or parent with the intent to cause dissent or contravene the policies and procedures of Vibe Dance Center will be dismissed immediately. •	If you have a concern or grievance you must make an appointment with the studio directors, Jessica Anderson and Elizabeth Bedore, or you are welcome to send an appropriate email to info@vibedance.net to discuss the issue. I understand that my child can be refused temporary or permanent admittance to class or recital at any time for any reason or for non-payment of tuition, costumes, or other balances on my account. Noncompliance with any other studio policy can also result in my child being dismissed from class. These policies are subject to change. An updated version will be kept in the Parent Portal for review at all times.